In this article, we discuss the nature of Phenibut dependence and Phenibut addiction. Phenibut is a powerful substance and needs to be taken in an informed and responsible way, with due respect for its potentially strong effects. Unfortunately, many companies do not provide adequate information for their customers to use Phenibut properly. It’s important to be aware of the risk of Phenibut tolerance, dependence, side-effects, and withdrawals. There is an important difference between physical dependence and addiction – the former being the physiological side effect of substance abuse and the latter being an underlying psychological disorder which can manifest itself in the form of substance abuse but also in the form of other harmful addictive behaviours. Although Phenibut can be a uniquely valuable substance when used as intended, it is also very powerful and has the potential for misuse when not used as intended. Phenibut is not suitable for individuals who have experienced physical dependency on a substance, and must not be consumed above the recommended serving instructions. If you find yourself consuming Phenibut outside of the recommended serving guidance you should contact your doctor and cease taking Phenibut - in consultation with your doctor. Luckily, there are also some great Phenibut alternatives available, including a number of natural and plant-derived alternatives which can be taken safely on a daily basis. For more information about Phenibut, read through our blog post of the Top 20 Questions that people ask about this substance. It includes information about the chemical, its effects, and how to take it. Phenibut Dosage Guidance: Do not exceed! c. NEVER take Phenibut more than twice per week. For first time users, always start with the lowest amount, to assess how your body responds to the substance. Exceeding the recommended serving guidance can cause side-effects and tolerance build-up, and substantially exceeding the recommended serving guidance for extended periods of time may become a manifestation of an addiction disorder and may lead to physical dependence on Phenibut, calling for tapering to reverse. It is important to note that there is a difference in strength between Phenibut HCl and Phenibut FAA. We recommend using lower doses when taking Phenibut FAA. For more information, read our article about Phenibut HCl vs Phenibut FAA. 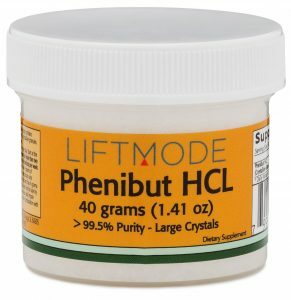 Phenibut Cycling: No more than twice per week! To prevent building a Phenibut tolerance, we urge Phenibut users not to use the substance more than twice a week. Taking Phenibut more than twice per week may lead to Phenibut tolerance, which in turn is the first step towards developing Phenibut dependence. If you continue to take Phenibut in larger amounts or more frequently than the serving guidance over a substantial period of time, your body could develop dependence. The development of physical dependence becomes a partial contributor to some peoples' struggle with Phenibut addiction. Using Phenibut with tranquillizers, depressants, dissociatives, or sleeping pills can increase the sedating effects of both substances. Do not combine these substances. Phenibut is a GABA derivative and is capable of causing strong effects on your central nervous system (CNS), especially if taken above the recommended serving guidance. It affects both your mood and your physical body. It is important that you understand the potential side effects of Phenibut before taking it. Phenibut side effects have not been extensively studied or published in academic journals. As a result, some of the best sources of information about Phenibut side effects are from subjective first-hand experiences on the internet. Examples include Reddit and Erowid.org. Importantly, these side effects are more pronounced at higher doses. Most people who take Phenibut within the recommended dosage range do not complain about experiencing Phenibut side effects. Phenibut has a long onset time of around 2-4 hours for most people. Do not take more Phenibut if you can’t feel the effects within this time. As with all compounds, there are some people who will not respond to Phenibut at all due to a number of physiological reasons. If you don’t feel any effects, do not take extra Phenibut. It is possible to overdose on Phenibut. Exceeding the recommended dosage can be very dangerous for your health. For safety reasons, please ensure that you do not exceed the recommended dosage and always use Phenibut in cycles. There is not enough research to show whether or not Phenibut is safe for pregnant or breastfeeding women. Do not use Phenibut if you are pregnant or breastfeeding. For more information, read through our article on Phenibut Safety. Phenibut Dependence: Taper off your dosage to avoid withdrawals! Using excessive amounts of Phenibut can cause your body to build a tolerance to its effects. This means that you would need to take increasingly larger amounts of Phenibut to feel the same effects as before. Taking large amounts of Phenibut for prolonged periods of time could result in your body developing a physical dependence on the chemical. There is a wide range of information available on internet forums and chat-groups about working through a Phenibut dependence. If you believe that you may be dealing with Phenibut dependence, it is not advisable to stop using Phenibut cold-turkey. Phenibut Addiction: Act on your feelings and get help! There is an important difference between Phenibut addiction and Phenibut dependence. It’s clear that some substances have an extremely high habit-forming potential. However, it is also clear that not everybody who drinks alcohol becomes an alcoholic. Nor does everybody who tries a cigarette become a smoker. Addiction stems from underlying psychological issues and possibly also from environmental, social, and genetic factors. Addictive substances provide an escape from the normal state of consciousness. The disease of addiction causes the victim to compulsively seek this escape. This is why we prefer to talk about Phenibut dependence rather than Phenibut addiction. If you are addicted to Phenibut, simply quitting Phenibut will not cure your addiction. It is very likely that you will either relapse or simply seek a new addiction elsewhere. If you believe that you have (or a someone you know has) a Phenibut addiction, it is very important that you seek help – both from a psychologist/addiction treatment centre, as well as from your friends and family. How do I know whether I have a Phenibut dependence or a Phenibut addiction? While physical dependence results from the overuse of a substance, addiction is a disease that often requires long-term management and treatment facilities. Sometimes, it can be hard to tell the difference. A sure-fire way to tell whether or not you are addicted to something is to challenge yourself to stop. If you can bring yourself to stop using Phenibut (either by simply not taking it for a while or by reducing the dosage in increments) and do not experience subsequent cravings or seek new ‘escapes’, then you do not have an addiction problem. As your Phenibut tolerance increases, the equilibrium of chemicals in your brain changes. Phenibut addiction often goes hand-in-hand with overuse and the resulting physical dependence. Addiction to any substance is unnatural and is classified as a disease. Your body now requires Phenibut to avoid experiencing withdrawal symptoms. You experience strong cravings and urges compulsive seeking of Phenibut, and an inability to control your use of the substance. These cravings often lead to negative and destructive behaviour patterns. Dependence can be addressed through incremental reductions in dosage, or through medical interventions (like using Baclofen). Treatment for addiction requires a combination of medical interventions for physical dependence and behavioural therapy. Most people who take Phenibut simply use it to promote a calm, relaxed mood and to help with regulating stress. This is its primary function and the reason why it is so popular. When using Phenibut at the recommended dosage and cycling it correctly, there is no need to worry about developing a dependence on it. However, there are people who have developed Phenibut dependence, and some have even struggled with Phenibut addiction. If you feel that you have been overusing Phenibut and would prefer to use something with less of a habit-forming potential, why not try one of these great alternatives to Phenibut? In summary, Phenibut dependence is more of a concern for the general Phenibut user than full-blown Phenibut addiction. Dependence occurs after using Phenibut incorrectly or irresponsibly for a prolonged period of time. This is not always the user’s fault. Unfortunately, some companies sell Phenibut without taking the necessary steps to inform their customers how they should be using the substance responsibly. Phenibut is a powerful substance and must be used responsibly. To avoid Phenibut dependence, always use the substance within the correct dosage range and remember to use it in cycles. If you feel that you are having difficulty in using Phenibut responsibly, we recommend trying one of the great Phenibut alternatives, including Magnolia Bark Extract, Oleamide, or 5-HTP. S Sankary et al., “Phenibut overdose”, Am J Emerg Med. 2017 Mar;35(3):516.e1-516.e2. RJ Malcolm, “GABA systems, benzodiazepines, and substance dependence”, J Clin Psychiatry. 2003;64 Suppl 3:36-40.